Bulk prices available. Contact us for more info. 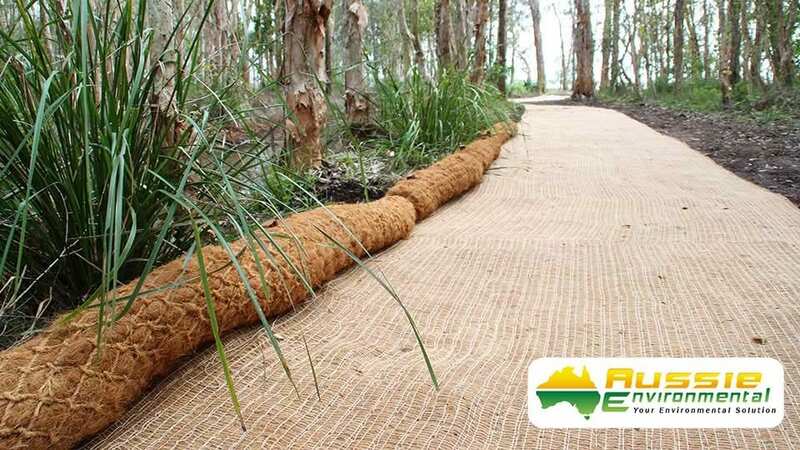 Aussie Environmental Coir logs are 100% bio degradable, designed to protect steep surfaces from heavy flows and sediment movement. What are Coir Logs ? 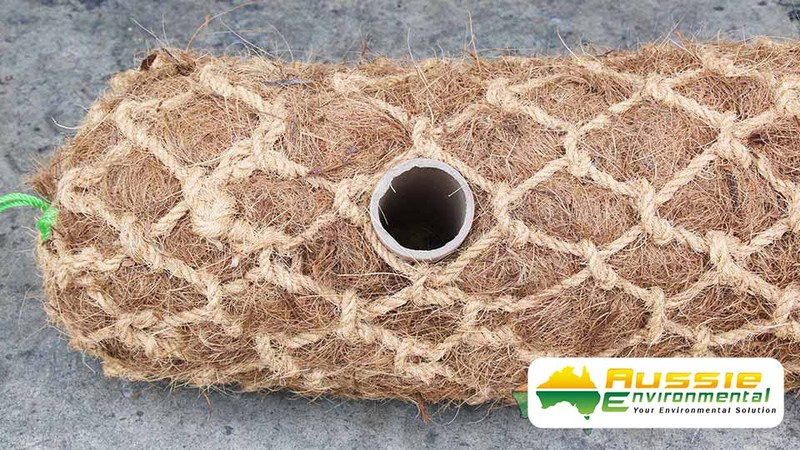 Coir logs, also known as coir rolls, coconut fibre rolls or coco logs, are tubes filled with loose, but densely packed coconut fibre which is then wrapped with coir netting. 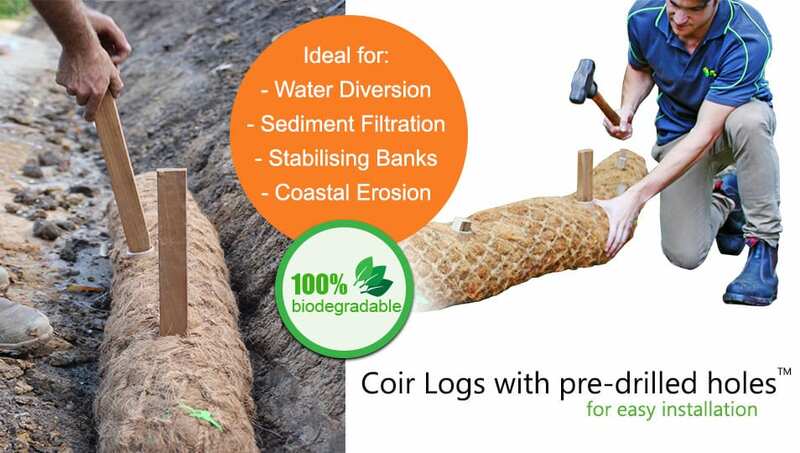 Aussie Environmental Coir logs are light-weight and easy to install – ideal for constructing check structures, establishing vegetation, managing changes in stream flow velocity, shaping channels and stabilising shorelines. Aussie Environmental Coir Logs are 100% biodegradable, can blend into their surroundings and over time provide habitat for animals and plants, and flexible which can curve around river banks and existing vegetation. Coir logs can be used in open drains to slow water velocity and capture sediments or be used in streams and rivers to produce a natural wall of protection for plants and soil. 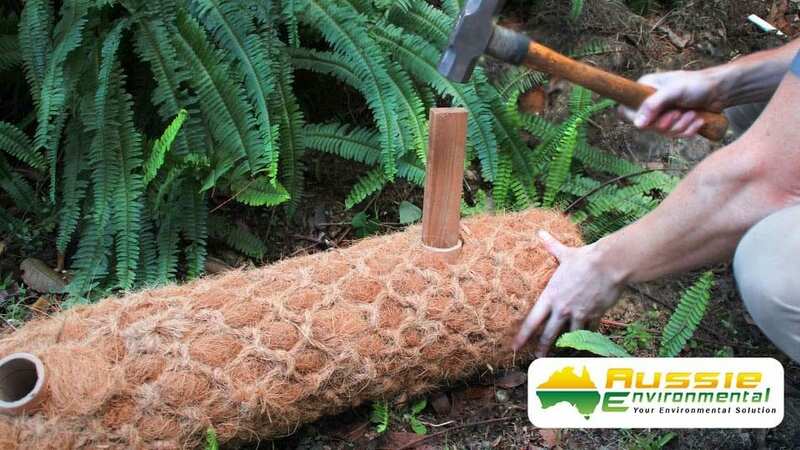 Why Should you use Aussie Environmental Coir Logs? 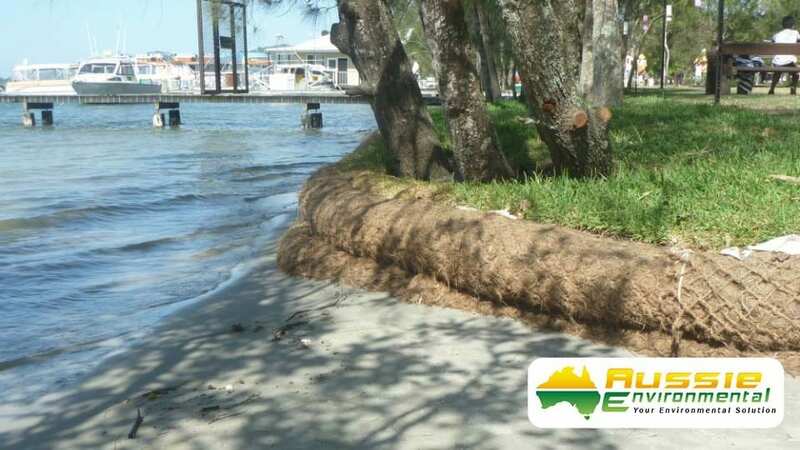 Aussie Environmental Coir Logs protects steep surfaces from heavy flows and sediment movement. 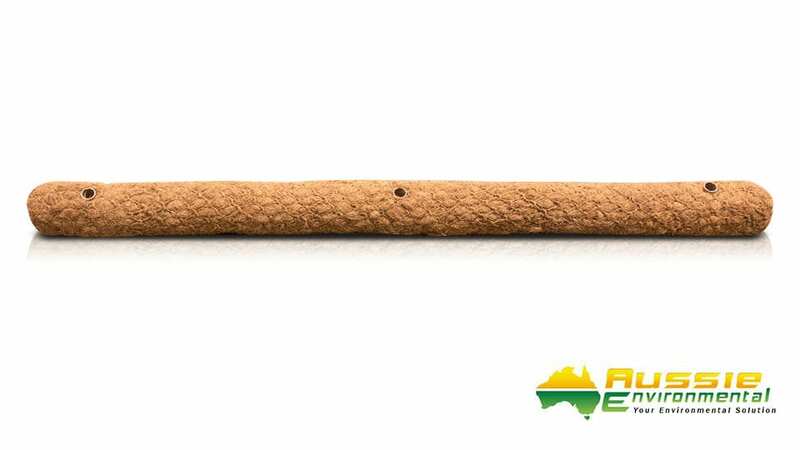 Aussie Environmental Coir Logs have pre-drilled holes for easy stake installation. 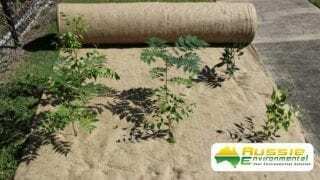 Coir fibre has a two to three year life which allows for full plant and soil establishment, natural plant invasion and land stabilisation. 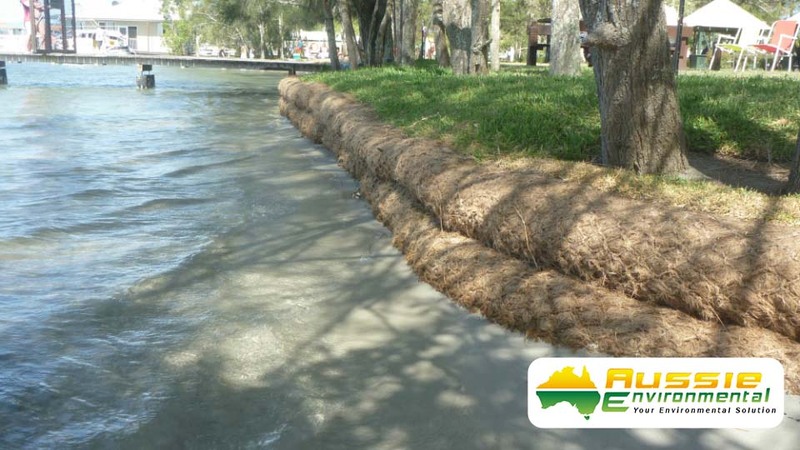 Being 100% natural and biodegradable, coir fibre functions as a soil amendment. 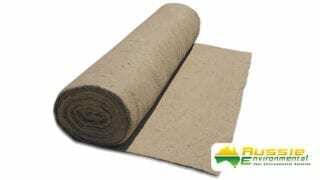 Water absorbent coir fibre acts as mulch on the soil surface. Coir logs provide a micro-climate for plant establishment, promoting balanced, healthy regeneration of habitat. 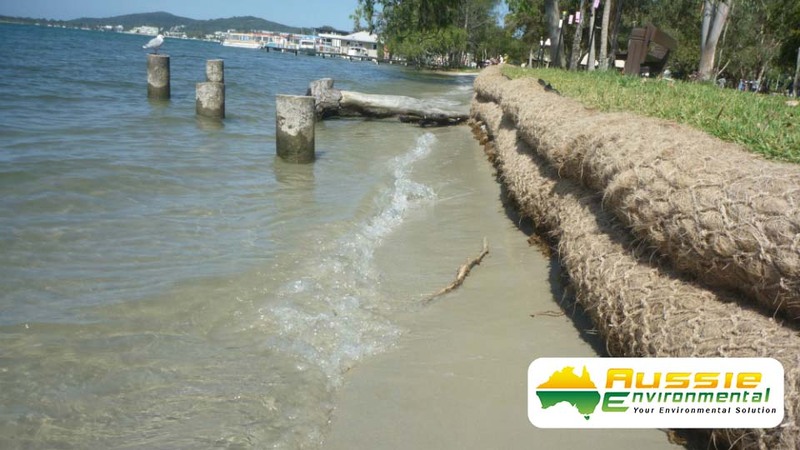 Coir logs provides restoration of terrestrial, aquatic, and riparian ecosystems. 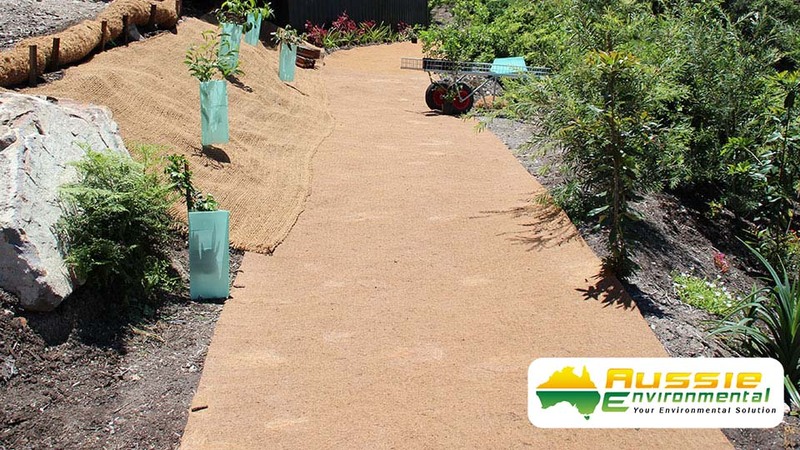 Coir has the characteristic of being environmentally responsible and aesthetically pleasing. Capable of being customised to specific requirements/technical specifications according to the site conditions. 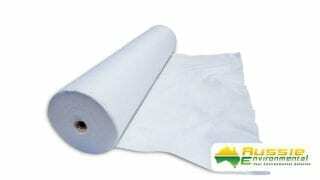 Excellent air and water permeability. Holds seeds and revegetation tube stock in place. 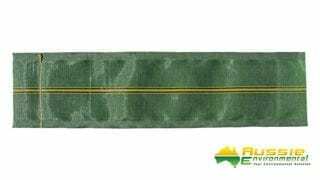 Easy to install and follows the contour of the soil surface. 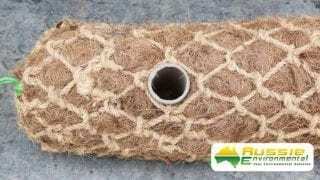 Coir is a renewable natural resource. Anyone can install them, as very little tools and equipment is needed. Where Should you use Coir Logs? 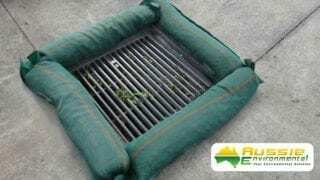 In open drains found along roads where they are used to capture sediments and slow water runoff. Along steep slopes and gullies where silt fence installation is not possible or safe to do so. 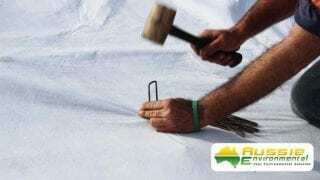 The protection of gutters and footpaths. 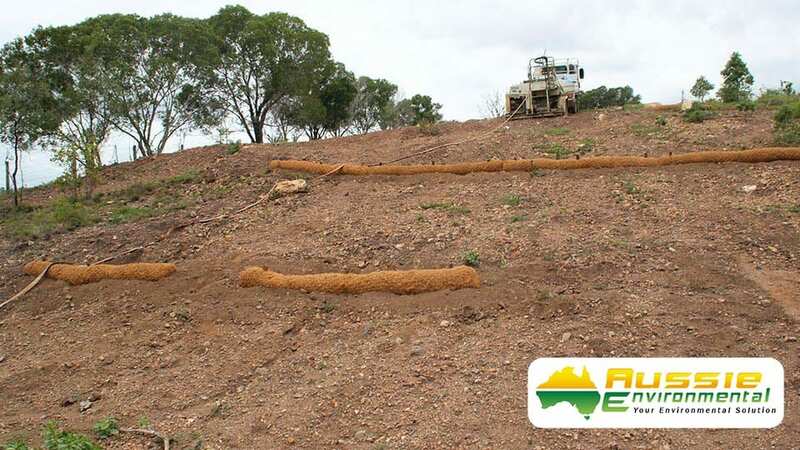 In revegetation areas where you require the products to break down over time and become part of the environment. Along river banks and streams for bank stabilisation to reduce wave action. For maximum stability create a trench 100mm deep. Place log into the trench and pack loose soil back around the log. Use only untreated hardwood timber pegs 600 or 900mm high. Insert pegs through each pre-drilled hole. Pegs should be at least 200 mm into the ground. Maintenance should always be carried out; this may include re-staking and disposal of excess sediments. Coir logs should be placed at the toe of the bank in a trench, half the depth of the log if possible. Place coir log parallel to the stream bank. Use only untreated hardwood timber pegs 450mm or 900mm high depending on soil substrate composition. Correct anchoring of the logs is essential for long term applications. Pegs should be inserted through the netting on the outer edge of the logs. Pegs should be inserted opposite each other and lashed together with biodegradable or coir twine. Holes may need to be drilled into the pegs to stop the twine slipping off. 400mm peg centres if installing into a high in-stream water flow. 800mm peg centres if installing into a low in-stream water flow. Pegs should always be cut off just below the height of the log to ensure safety. Pegs should be inserted 150mm from coir log ends. Terracing can be achieved by repeating the same process but installing the next coir log behind the first installed log. Maximum allowable wave height should not exceed log or stack height. Log ends should be set 300mm into the bank at each end of the installation area. 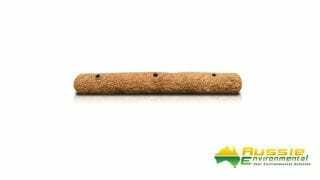 Biodegradable matting may need to be used in conjunction with the logs to retain as much soil as possible until plant establishment. Maintenance should always be carried out; this may include re-staking and lashing, and removal of exotic plants and weeds. It is also possible to plant into the logs using endemic aquatic plants or mangroves (Should always check with relevant authorities before doing this, and ensure the plants will have enough moisture to survive).